GPU Performance - The LG G7 Review: A Rushed Attempt? The LG G7 Review: A Rushed Attempt? GPU performance again is a known vector for the G7 as it should not differ from other Snapdragon 845 devices. The only way the G7 is to distinguish itself from other phones is in terms of the device’s thermal dissipation design and the resulting sustained performance. In the CPU-bound 3DMark Physics test the main factor for lower sustained performance is the throttling levels imposed by the thermal drivers. 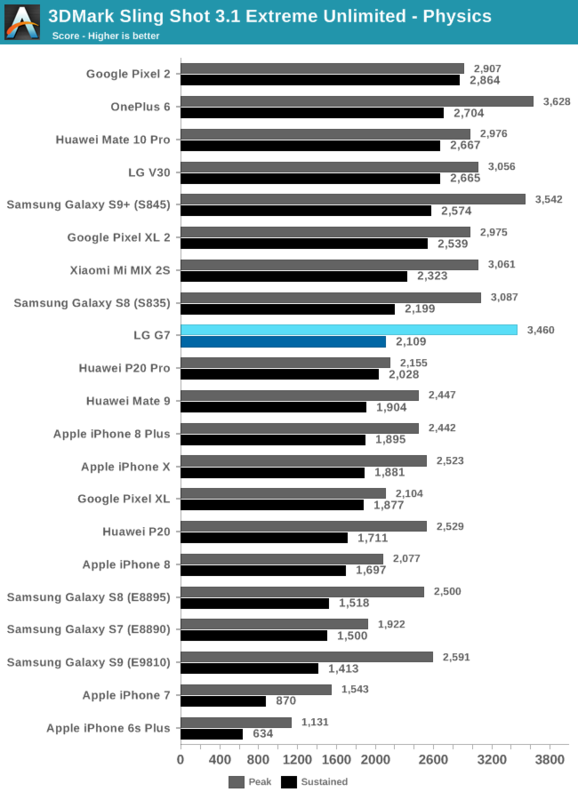 Here the G7 ends up as the worst Snapdragon 845 device with a 40% performance regression compared to its peak performance. 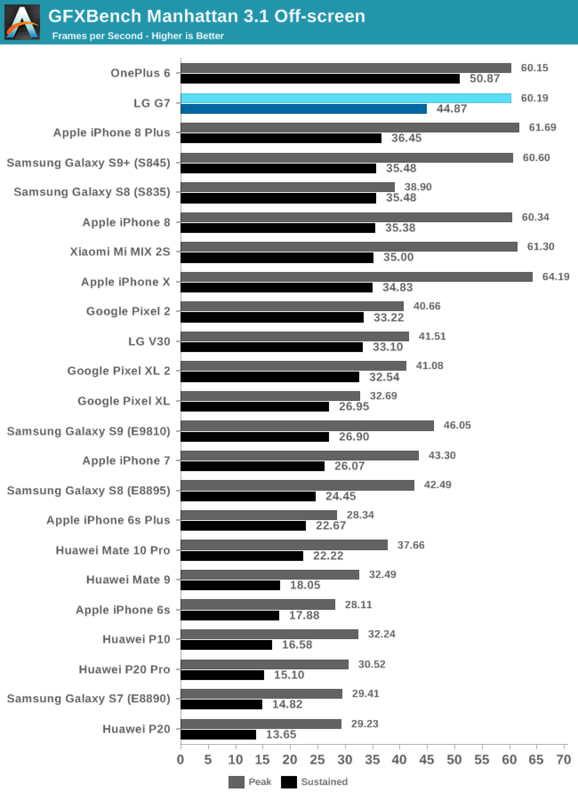 When looking at 3D/GPU performance we however see the G7 perform quite well as it manages to surpass sustained performance of other Snapdragon 845 devices, bar the OnePlus6’s excellent results. As a reminder, the sustained performance scores are done by continuously running the workload under constant environmental conditions until its performance no longer degrades (and it reaches thermal equilibrium). 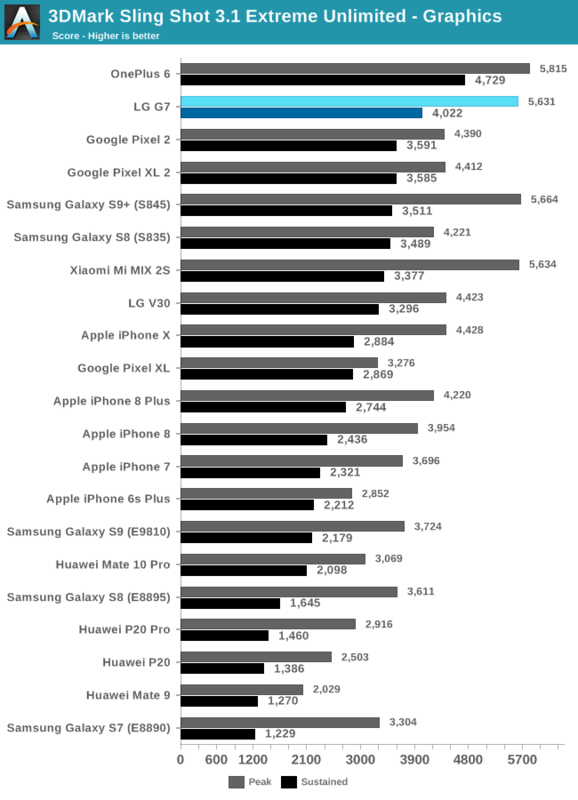 In GFXBench Manhattan again the G7 performs great as it manages to shrink the peak-to-sustained performance delta, again only trailing the OnePlus 6. 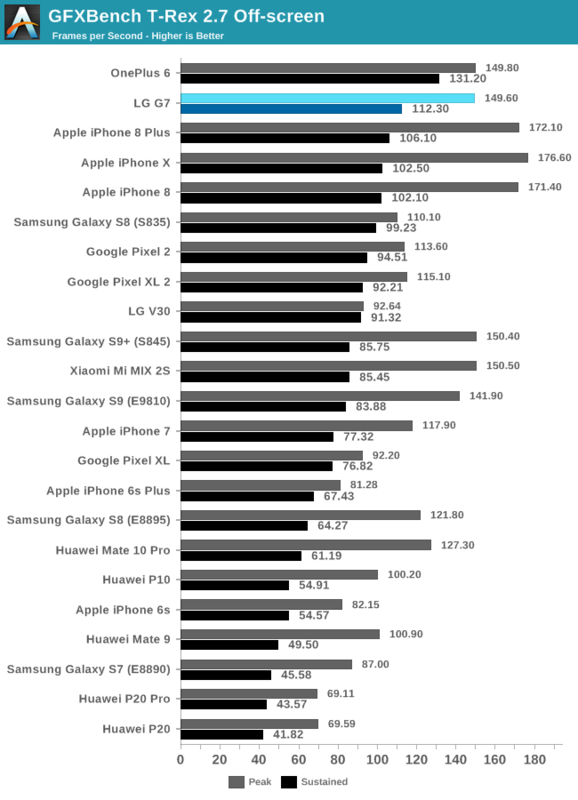 Finally for the T-Rex test we see a similar advantage over Xiaomi and Samsung’s S845 phones. I re-verified the scores of the latter by running them again side-by-side to the G7 and OnePlus 6 to eliminate any concerns of changing environmental conditions and indeed the resulting scores were identical. While not matching the OnePlus 6 – the G7 does fare quite well against all other devices. Like on the OP6, I’m not sure if this is due to a better thermal design of the phone or if there’s been a rework in the thermal drivers. What can be said however is that the G7, like the OP6, does exhibit lower temperature hotspots during testing than the MIX 2S and S9+. I verified the power consumption of the G7 to also eliminate the possibility of a potentially more efficient chip bin and again the power matched that of previous S845 phones, so like on the OP6, the better performance cannot be attributed to lower power.